Ben Affleck is this serious about directing a solo Batman movie. All Images: Warner Bros.
Last week, we were fortunate to visit the London set of Justice League (read about it here). While on set, Ben Affleck approached the journalists in his full batsuit (minus cowl) to talk not just about that movie, but his solo Batman film. Here’s the short version of what he said: It’ll be ready when it’s ready. What that script will entail is, obviously, still a mystery. 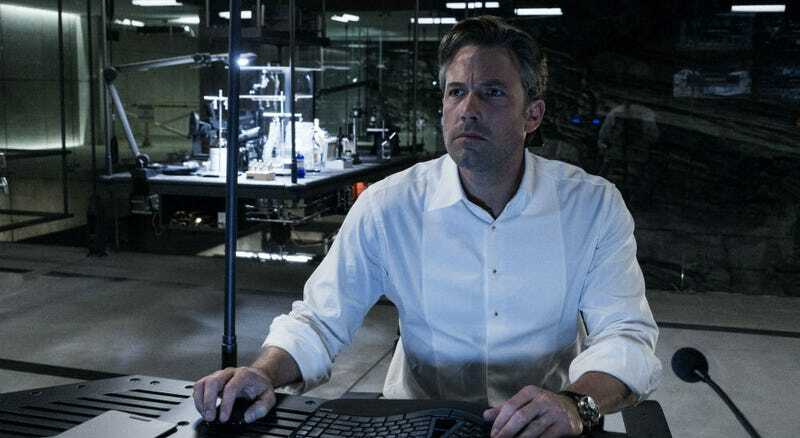 Affleck did say, however, that we’d see the character be more of a detective in the eventual Batman movie (as well as in Justice League, for that matter). Affleck and Snyder on the set of Batman v Superman. Before that happens, though, Affleck will appear and contribute to Zack Snyder’s Justice League, a film he’s not only starring in, but now executive producing. Though rumors circled that Affleck’s promotion was so he could have more control over the film, on set he gave a much more logical explanation. Though Affleck said Warner Bros. has a date for his Batman movie, we don’t know which of the untitled movies the studio has staked out on the calendar are for him (it’s likely something in 2019 or 2020). But for now Batman seems to be on Affleck’s schedule, not WB’s.